Are you looking forward to the holidays? We know it can sometimes be difficult to find that perfect gift for a pup or kitty in your life. Knowing that some pets are quite spoiled (as they should be), Budget Earth is excited to share with everyone their top 10 Holiday Gifts for Picky Pups & Kitties. Each of these items on the list are perfect for even the fussiest dog or cat, and are sure to make pet parents smile! Want the chance to win one of the awesome products featured in Budget Earth's post for Picky Pups and Kitties? Well, we have awesome news for you! Budget Earth and some of their favorite bloggers are excited to be working with Petmate on this awesome giveaway! 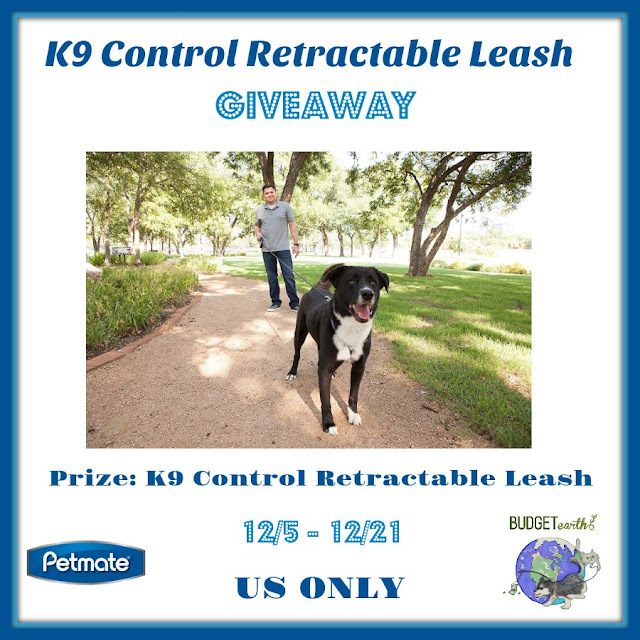 One very lucky reader will win a K9 Control Retractable Leash in their choice of size. Ready to enter? Make sure to read all the rules below and then enter through the Rafflecopter! Sweepstakes ends December 21st at 11:59pm ET. A disclaimer and disclosure: The participating bloggers were not compensated for this post. We are not associated with any of the companies named above. No purchase is necessary to enter. One entrant per household. Void where prohibited by law. The odds of winning are based on the number of entries received. Confirmed Winner(s) (by Random.org) will be contacted by email. Winner(s) have 48 hours to respond before a new winner is chosen. The sponsor(s) will be responsible for product shipment to winner(s) of this sweepstakes. Wrapped Up N U is not responsible for product shipment/delivery. This event is in no way administered, sponsored, or endorsed by, or associated with Facebook Twitter, Google, Pinterest or any other social media network. This disclosure is done in accordance with the Federal Trade Commission 10 CFR, Part 255 Guides Concerning the Use of Endorsements and Testimonials in Advertising. My son has three dogs and I am still trying to decide what to get them. This is so nice and something he could use. He has two labs and a boxer. These are their children. I give my dog special treats for Christmas. She loves the special treats.